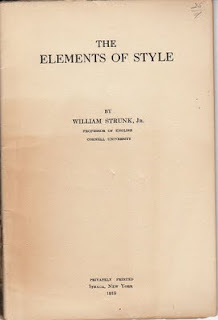 I recently acquired a copy of the 1919 edition of The Elements of Style by William Strunk, Jr. for my Elements of Style Collection. While collating the book, I was surprised to see that the printer was identified on the verso of the title page as the Press of W. F. Humphrey, Geneva, N.Y. I thought at first that it had to be a typo because the bibliographic records at the Library of Congress and elsewhere identify the Press of W. P. Humphrey, Geneva, N.Y. as the printer of the 1918 and 1919 editions. 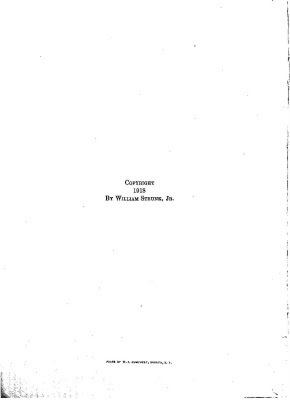 Moreover, W. P. Humphrey is listed as the printer of the 1918 and 1919 editions in the Catalogue of Copyright Entries published by the Library of Congress. A quick check online, however, revealed that there was a printing firm by the name of W. F. Humphrey in business in Geneva, New York during that period. "I examined two copies of the 1918 and one copy of the 1919 Elements of Style immediately available to me in our Rare Books Collection, Division of Rare and Manuscript Collections. "Examining first the 1919 copy, I saw that the very small typeface could easily be read as W. P. Humphrey. With my reading glasses, however, it is clear the name is W. F. Humphrey. "As for the 1918 copies, both have what appears to be the same printerstatement on the title page verso as the 1919, but for the 1918, it isconsiderably harder to discern whether the letter in question is a P or an F. I think the impression is simply not a good, clean one and that it could therefore very well be an F. One cannot with absolutecertainty confirm it as a P. So I would, given the history, the appearanceof the typesetting and so forth, say it was an F.
"Our cataloguing records thus appear to be wrong for the 1918 and 1919 editions. Several days later I again examined the three items mentioned above this time with a fairly strong magnifying glass. I came away even more convinced than before that we are looking at W. F., not W. P.
"The 1919 edition we have is unequivocally W. F. "In the 1918 editions, it is clear under magnification that the tops of the letters across the entire printing statement suffer from inadequate impression. Thus the F in the word "of" in the statement is identical to the F in the initial pair "W. F." (remembering that these are all small caps). One can also see more clearly the curved segment in the letter P of the word "press" connecting the upper and lower horizontal strokes. This curved segment is of course absent where the letter F is confirmed. 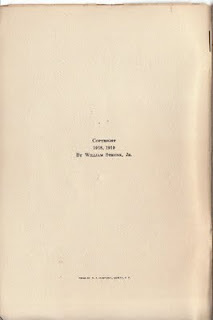 "I have included an image in jpeg of the title page verso of one of our 1918 copies. Using a viewer such as Windows Picture and Fax Viewer at a quite high magnification--remembering these printer's statements are extremely small on the originals--one can clearly see the defects in printing across the tops of the letters and consequently see why the F was interpreted as a P.
"The jpegs are moderately large. I have included one of the title page as wel as one of the title page verso. While Patrick was examining Cornell's copies of the 1918 and 1919 editions, I was researching the histories of the Press of W.F. Humphrey and the Press of W. P. Humphrey. If the records at Cornell were wrong, that meant the records at the Library of Congress, WorldCat, and everywhere else in the book world were wrong. The Press of W. F. Humphrey had been in the printing business in Geneva, New York since the late 1890s. In 1896 its place of business was 30 Linden Street. In 1917, its place of business was 300 Pulteney Street. William Francis Humphrey was the proprietor of the W. F. Humphrey Press. While a student at Hobart College in Geneva, he was an editor of the Hobart College Herald. His firm later became the printer of the Herald. His firm also printed the Cornell Law Quarterly. William Francis Humphrey was very active in the community. He was a member of the Elks, the Masons, Trinity Church, the Chamber of Commerce, the Rod and Gun Club, the Geneva Country Club, and the United Typothetae of America. He died of pneumonia in 1934. On the other hand, the Press of W. P. Humphrey was not in the printing business in Geneva, New York. At least Karen Osburn, Archivist of the Geneva Historical Society, could find no record of its existence. Google Books erroneously lists W.P. Humphrey as the printer of numerous works; but an examination of the printer's name on the publications will show the same problems with the typeface as experienced with the 1918 edition of The Elements of Style. The only publications listed in the records of the Library of Congress in which W.P. 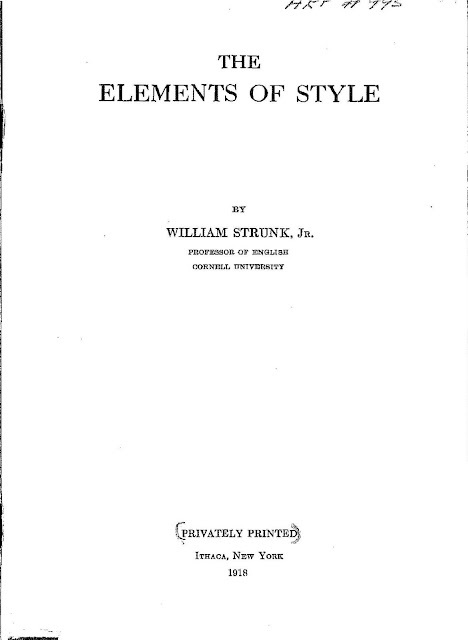 Humphrey is identified as the printer are the 1918 and 1919 editions of The Elements of Style. And now we know that these records need to be corrected. The Library of Congress corrected its records on Sept. 28, 2009. "If two or more clauses, grammatically complete and not joined by a conjunction, are to form ...."
But in Strunk and White, the two commas are missing. If I could find a copy of Strunk and Tenney (1935? ), I might be able to confirm that this is indeed White's doing. (Your stated concern with W. Humphrey's middle initial suggests that you might be sympathetic with my problem.) Can you suggest a source? I'd be happy to pay for a legible reproduction of any sort. I would like to examine a copy of the c. 1940 edition. The Library of Congress does not have it. I am trying to determine the source of the sentence in the 1959 edition at the end of the "use the active voice" rule. It says "when a sentence is made stronger, it usually becomes shorter." I assume that it was added by E.B. White for the 1959 book, but I cannot be sure unless I see the last version that Strunk revised himself. Can you shed any light, or tell me where I can find a copy to buy or look at? The sentence you refer to concerning use of the active voice was not included in any of the early Strunk editions. White included it in his 1959 edition.